Elacytarabine (CP 4055) is a lipid-conjugated derivative of the nucleoside analog cytarabine. 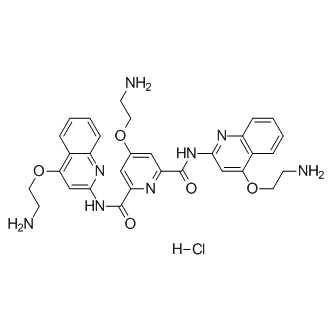 Elacytarabine (CP 4055) is an antineoplastic drug with cytotoxicity in solid tumors. Bleomycin A5 is an anticancer chemotherapeutic that binds DNA and induces DNA cleavage and strand breaks, it is highly toxic. Pyridostatin is a G-quadruplexe stabilizer, with a Kd of 490 nM. Pyridostatin hydrochloride is a G-quadruplexe stabilizer, with a Kd of 490 nM. 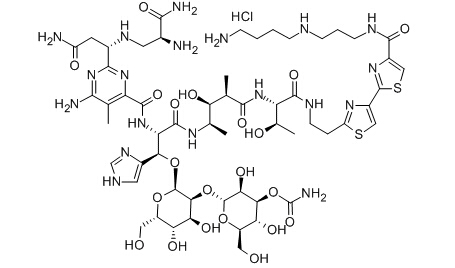 Lodenosine is a RNA-directed DNA polymerase inhibitor potentially for the treatment of HIV. CDM-NAG is a useful tool compound to deliver the siRNA. Homoharringtonine is an inhibitor of protein synthesis. Blocks elongation phase of translation by binding to the 60-S ribosome subunit. Antileukemic. Cycloheximide is a eukaryote protein synthesis inhibitor and antibiotic. 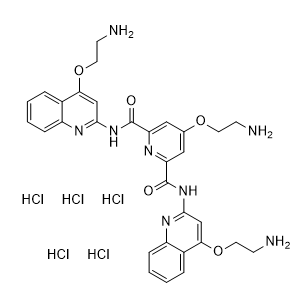 COH29 is a potent ribonucleotide reductase (RNR) inhibitor with anticancer activity with an IC50 of 8 μM in KB cell. Capecitabine is an oral prodrug that is converted to its only active metabolite, fluorouracil (FU), by thymidine phosphorylase.